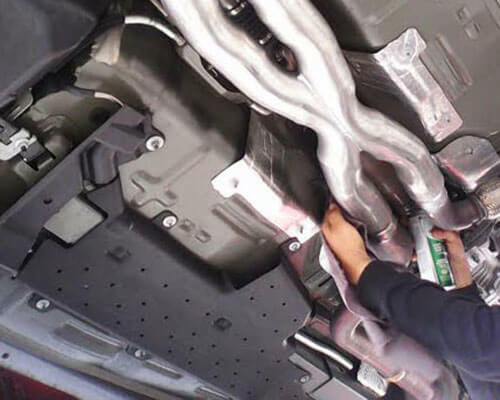 Budget Muffler Brake & Automotive is San Diego's premier muffler shop, providing expert exhaust system installation, repair, and replacement with superior service at highly competitive prices. We've served the local San Diego area since 1941 (first as A&M Muffler and then as Budget Muffler Brake & Automotive), and have installed tens of thousands of mufflers over the years on nearly every type of car. We not only work on domestic and foreign vehicles of all makes and models, but also excel at speciality vehicles, such as lowriders, drifters, classic cars, hotrods, and sports cars. Moreover, we have one of the largest exhaust system inventories in all of San Diego and can custom make pipes. By being able to repair or replace just those parts of your exhaust system that have been damaged, we are able to complete most of our exhaust services within a day and at a fraction of the cost of our competitors. At Budget Muffler Brake & Automotive, our technicians are experts at diagnosing and resolving any and all exhaust system issues, whether it involves rattling sounds, a damaged muffler, or a rusted or bent component. Before proceeding with repairs, they will always review their findings with you and then present you with honest recommendations. Because we excel in both stock and custom exhaust systems, we are able to provide our customers with a wide range of options to suit each of their individual needs. Clients can choose either original equipment (OE) parts or brand name, aftermarket parts from MagnaFlow, Flowmaster, Flowsound, Walker, and Pro-Fit. Our inventory of stock parts includes flex joints, pre-made pipes, header pipes, flanges, gaskets, headers, and more. In addition to our large inventory of common stock parts, we also maintain a huge selection of performance exhaust parts. Investing in a performance exhaust system generally increases a vehicle's horsepower, performance, and fuel efficiency, and can give you the precise sound you are looking for, whether you want something quiet or want to get a premium "muscle" sound. We carry leading brands, such as MagnaFlow, Flowmaster, Flowsound, Eliminator, Corsica, and Street Flo, which offer you everything from single-chamber racing mufflers to quiet-performance mufflers. In addition, we can modify most exhaust systems with custom headers, cold-air intake systems, and single, dual, stainless steel, and colored tips. Come to Budget Muffler Brake & Automotive for all your muffler and exhaust system repair and replacement needs. San Diego customers can always rely on us for the highest level of automotive craftsmanship and rest assured knowing that we stand by our work with a 90-day warranty. Most of our exhaust system parts are also backed by excellent manufacturer warranties. Great place. Very friendly and professional staff. I needed to have work done to my muffler and also asked if they could take a look at my serpentine belt that has been making noises (I have had 3 other shops take a look at the belt to see if they could get it to stop . . .